Blood and holy water both run thick through the streets of 15th-century Florence in Rice's 21st novel of the undead, the second in a series of New Tales that leave New Orleans's cemeteries behind. While there's not much plot to this lushly described story of how Vittorio di Riniari became a vampire, there's plenty of period detail about Italy's Golden Age. With the courtly arrogance of one who's to the manor born, Renaissance man Vittorio tells of his seduction into evil immortality. As the 16-year-old scion of a wealthy home, he rubs elbows with Cosimo de Medici and is attracted to the work of Fra Filippo Lippi, whose tormented paintings of angels mirror Vittorio's own heart. In the year 1450, he witnesses the massacre of his entire family by a band of demons. Fleeing from the primal scene, he follows the fiends in search of vengeance, and instead is overcome by the devastatingly beautiful ""strega,"" the bare-shouldered Ursula. His desire for revenge--and his desire for Ursula--propel him in a dizzy descent to religion's darkest side, especially after Ursula's vampire attentions render him able to see and converse with angels. Though the narrative is presented as a tragic tale of doomed love, we know so little of the swooning, inarticulate Ursula that there's hardly any romance or suspense. 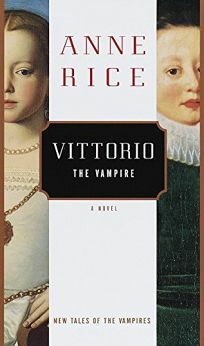 And while Vittorio's particular road to hell is a new entry in Rice's repertoire of vampirification, much of the material is familiar: the rich, brash young man transformed against his will who agonizes over his new existence. Vittorio's painstaking narration of his biography takes so long to acquire momentum that when at one point he admits, ""This chapter ought to be over,"" even diehard readers may be tempted to agree that it's time for a new vampire for a new age. Agent, Lynn Nesbit. (Mar.) FYI: Rice includes a bibliography of readings for greater appreciation of the time period.